In the remedy Calypte Anna the individual can manifest autistic qualities like neon. Similar to the qualities of an idiot savant, brilliant in one way, but unable to manifest it in a way that is useful. Like the noble gasses there is a lack of social interaction. They can have daydreaming and then suddenly be knocked out of it. They are very sensitive to sugar. They can taste sugar in foods that most people cannot taste. There can be a lack of masculinity. They have a heightened sensitivity especially to danger. They can be awkward, spontaneous, and alternate between a hyper state inside and torpor. They have a desire to hum. Hummingbirds are unique. They are new world birds. They can hover and fly backward. They live long, up to 14 years. The males put on dramatic displays of flight and singing. 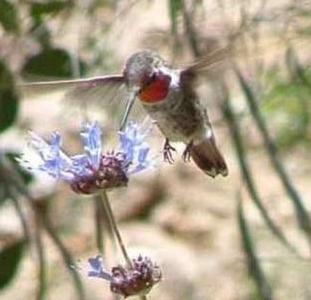 The hummingbird has the highest metabolic rate of any vertebrate and the highest heart rate of any bird. They are finicky eaters because they need high energy foods. In order to get the most energy from their nectar collection they test each flower and upon determining the one with the highest sugar content will return to it preferentially. Areas containing flowers with high energy nectar are sought after and fought aggressively for. Calypte Anna Proving, Cynthia Shepard.